Josiah has been gone for almost two months…how can that be? Almost daily, Esther asks if it’s been almost four months yet. Apparently time doesn’t fly as quickly when you are six as when you are….much older than six. We’ve been Skyping with Josiah on the weekends and it’s been really fun. We’re all curious about what living in New York City is like and Esther loves making faces and seeing herself in the little box. The subject of food came up, here’s how the conversation went. Josiah: For breakfast I eat cold cereal and for lunch I usually have granola bars but sometimes I get something from the street vendors. Josiah: There’s a Walgreen’s near my place so I just stop in there and see what clearance food they have. Josiah: Yeah, sometimes I don’t even know what it is. I just eat it. So there you have it. This is what 19 year olds eat when they are away from home and don’t have a meal plan. Of course I worry about the lack of nutrients and fresh food in his diet. But he is an adult and trying to make his own way and hasn’t asked for my opinion so I keep those concerns to myself. Instead I send him care packages. Early on it was because he needed something that he wasn’t able to fit in his luggage, like dress shoes or his coat but now, I send them just because. 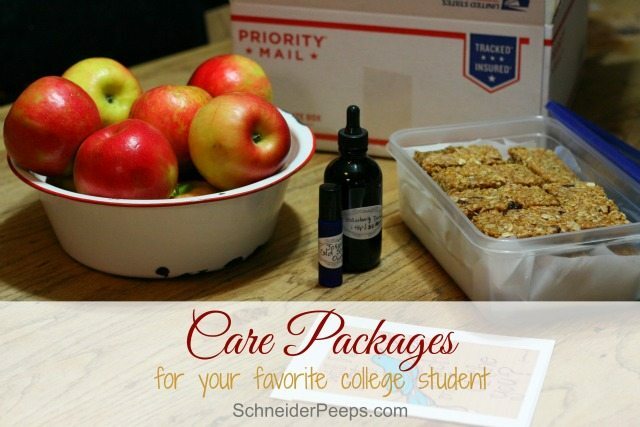 So, what can you put into a care package for college students – other than candy? Healthy snacks – Since the confession of not eating much (or any) fresh foods I’ve decided to put fruit in every box. This time I loaded it up with apples. I wrapped them individually, so hopefully they’ll ship well. Toiletries – Let’s face it, toiletries can be expensive and after a couple of months they are probably running low. Since I know one of Josiah’s aunts keeps him stocked in soap, shampoo and conditioner I added some lip balm. It’s getting cold in NYC (at least for a Texan) and I think some lip balm will be needed soon. Immune boosters – Since I’ve been making some cold and flu items for us I added a few of them to Josiah’s care package. I put some elderberry tincture and cold sore treatment with instructions on how to use them. Cash or gift cards – Cash, like a roll of quarters for the laundry, or gift cards are always appreciated. But it’s also nice to tell the receiver why you are putting it in there. For instance, instead of just putting What are some of your favorite things to put in care packages? 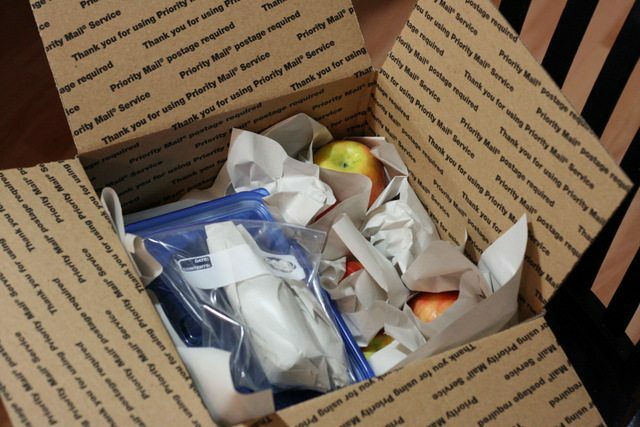 0 in the box and calling it good, how about putting a What are some of your favorite things to put in care packages? 0 gift card to a grocery store in there and say something like, “I know you really like grapes or watermelon or whatever it is that the person likes. 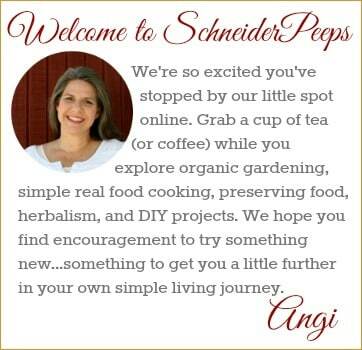 Enjoy some on us.” That way it’s not just about the money. Notes – It’s always nice to get handwritten notes, but it’s especially nice when you are far from home. If there are younger children in your home, invite them to write a note or draw a picture to put in the box. A while back a friend’s daughter told me, “I loved it when my family sent me boxes when I was at college. It was so exciting, we couldn’t wait to open i!.” I wish I could communicate the look on her face when she told me this, it was full of appreciation and fond remembrance as she looked back. Yes, what you put in the box matters but not as much as you might think, this is one time when the gesture really counts. However, if you need some help with ideas for care packages I suggest you get a copy of Gift it From Scratch. 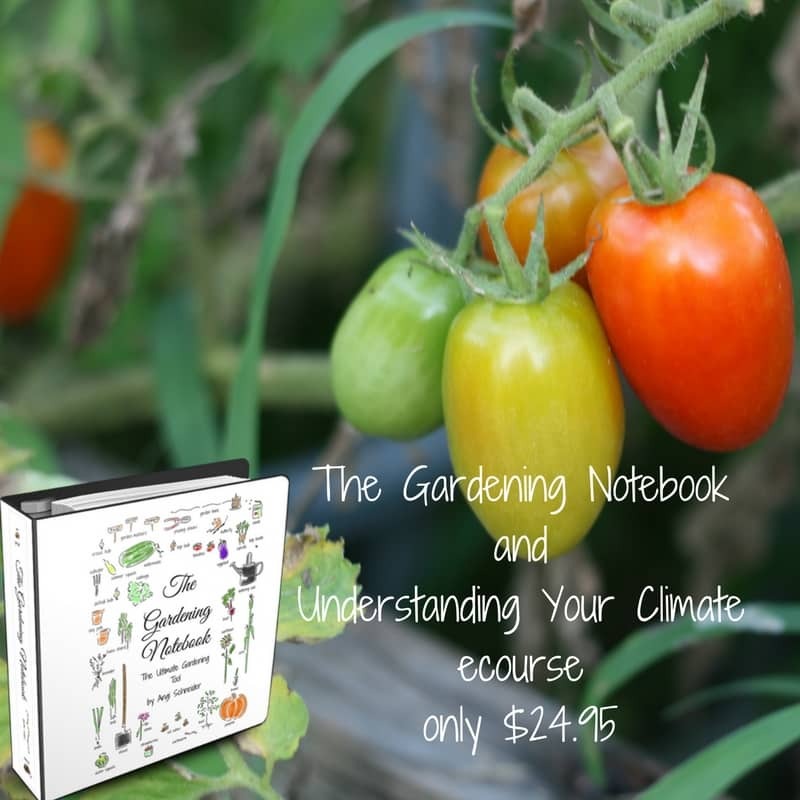 It’s so much more than just a cookbook. 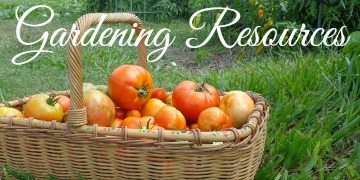 The author, Kathie from Homespun Seasonal Living, give all kinds of great suggestions for turning homemade food into wonderful gifts. In fact, I’m using several of her suggestions for Christmas gifts. 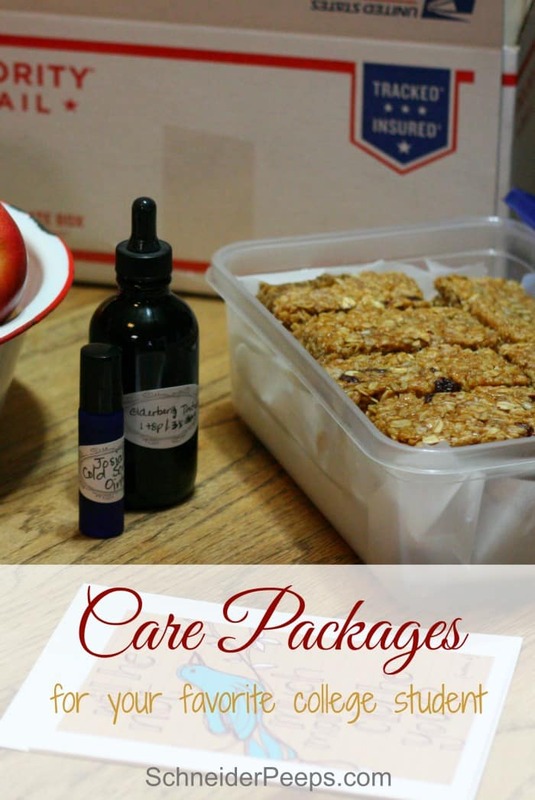 What are some of your favorite things to put in care packages? Such great ideas! Oh the days of being a poor college student, willing to graze anywhere for food. Yikes. Your box is a beautiful expression of love and care. I know…to be young again! I actually survived college on Dr. Pepper, Ding Dongs and Taco Bell. Care packages from Grandma with her homebaked goodies were always a hit…..and such a nice surprise…. I love this. Thank you for sharing. We just sent my “mothers helper” off to college and I’ve been wondering what kind of fun package to send her. Oh, I love all of these ideas! This is perfect timing, too 🙂 Thank you! My brother graduated college about 2 years ago (and my son is only 16 months!) but he recently moved to Boston for a job where no family is near, so I occasionally send him care packages. I always include some homemade food and pictures of his nephew, and he looks forward to them so much! Such great tips! What a great sister you are! There is nothing lonelier than being far from family, when your son gets a little older I bet he’ll have fun making pictures for his uncle. I send my son small care packages of his favorite beef jerky occasionally and last week I sent him one with home-baked cookies (two of his favorite kinds), a pillow, a DVD of home movies from when he was a baby, some soup, some toiletries and some cold medicine. On his birthday I baked red velvet cake in mason jars, included toasted pecans and store-bought cream cheese icing along with birthday plates, napkins and even a couple of balloons blown up. The fruit is a really good idea. I’ll try that next time! goodness! Can I be your child? I love the birthday cake in a jar idea, I bet he felt so blessed. My favorite care package when I was away at school, was a box of oranges picked from my parents trees. They weren’t ripe when I was home for Christmas and I was ecstatic to receive a whole, huge box (and so were my friends:-) in the middle of January. I bet that was a treat! I can’t wait for our orange trees to mature.